As a participant in the Tryazon Wewalka Party, I received an Wewalka party pack which included a coupons to try the product at the party and to share with my guests. All opinions expressed are my own. Pizza is a staple at our house. We have it on a variety of crusts. 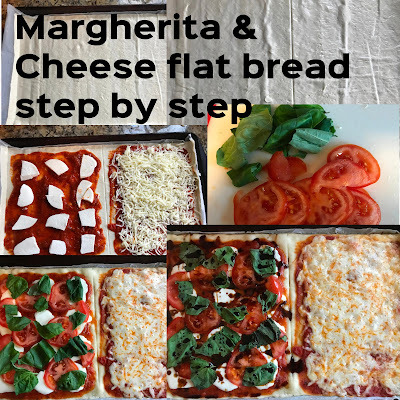 We do open face quesadilla pizzas on tortillas, we use leftover buns and bagels to make pizzas, we use bread dough, dough mixes and homemade dough. We top them with all sorts of toppings - simple to complex, sweet and savory. We enjoy it at any meal and as a snack too. So, when I got the opportunity to try Wewalka European Bakery Style Dough, I was excited. I spent a couple of evenings studying the website and finding inspiration and recipes to try at our party. 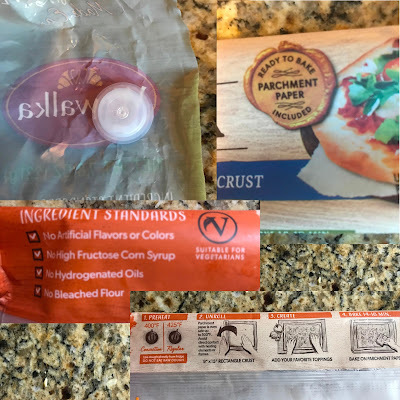 I wound printing out a recipe for shrimp flatbread, a buffalo chicken calzone, a chocolate cherry cheesecake pizza, jalapeno popper puffs, bread sticks and a prosciutto pizza. I made up my grocery list and headed off to find my ingredients and the dough. My store carried four varieties of their dough - Puff Pastry, Flatbread, Classic Pizza and Bistro Pizza. I decided to grab a couple of each to try at the party, using the recipes I found or improvising with other pizzas we enjoy. Before the guests arrived, I started with prep work and even got a couple of the things in the oven. I wanted the guests to see and work with the product, but with basketball on in the background and plans to play poker, I knew attention would be divided and I would have to prepare to ensure we got to also try more product than we prepped during the party. Plus, you can only have so much in the oven at a time and I only have three baking stones. I love that the dough comes on parchment paper and is refrigerated, so when you are ready to bake you can simply unroll, top and bake. The packaging is great too, as it is a flat sleeve and can easily stack on the side of my refrigerator, making them easy to access. As I opened the packaging to make the first recipe, I noticed this small valve on the inside. I assumed it had something to do with minimizing moisture build-up on the dough, but to be sure I looked it up on the website and learned that the valve is part of their packaging because they "use real, live baker’s yeast which needs to slowly release carbon dioxide, so we’ve added specialized valves to the packaging. Our yeast ensures your pastries and pizzas always rise up and bake to perfection." (I like it, great way to ensure the freshness and deliver performance of the product). Baking on the parchment paper sure made clean-up easy, which was especially good for the party, since we only had three stones and one pan that we were using. 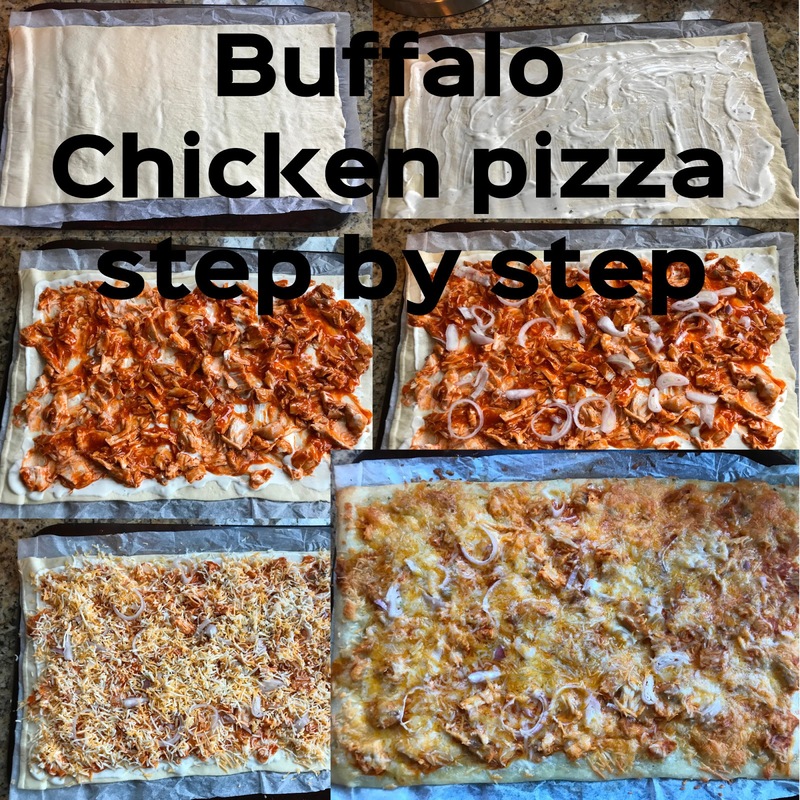 Started with a traditional pizza crust, used ranch dressing to cover the dough, added chicken that had been mixed with buffalo sauce, then added onions and shredded colby jack cheese and baked according to the package. Started by unrolling a flatbread and scoring it to create two halves. Added pizza sauce as a base to each side. Added fresh mozzarella slices on one side and shredded Italian cheese on the other. Baked it according to the package directions. Then, added fresh sliced tomatoes and fresh basil. Returned it to the oven for 5 minutes, then drizzled with balsamic. The traditional margherita pizza and the half margherita/half cheese flatbread were delicious. I think that margherita pizza is one of my favorites, there is just something about the fresh tomatoes and the drizzle of balsamic that is so tasty. 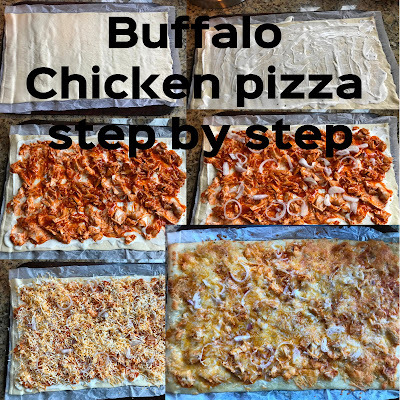 We wound up making a buffalo chicken pizza in addition to the calzone. The jalapeño poppers, which we left the bacon out of, were delicious, but I would make them smaller next time - everyone was cutting them in half to enjoy anyway. The shrimp flatbread was tasty, but compared to the other offerings, just wasn't as popular. Everyone loved the chocolate cheesecake pizza, it was super rich though and so we had a good amount left over (not a bad thing at all - meant we got to enjoy some the next day). I liked the flavor of the product, but found that based on the timing on the directions and/or on the packaging for those that we improvised, that the pizza and flat breads did not bake up as much as I prefer. I don't mind a soft crust and it works fine for a lightly topped flatbread, but it made it difficult to plate up the chocolate cheesecake pizza and the calzone was also difficult to cut and plate for sharing. I found that extending the cooking time helped it cook up a little more. Also, those items that I tucked in the oven to reheat also crisped up nice directly on the stone. The ease of use of the Wewalka pizza and flatbread products is tremendous. As a busy mom, I could feasibly make and bake a (nearly) homemade pizza for my family in about 20 minutes including prep, which is important on those nights with games and practices that leave little time for dinner. The dough being rolled up with the parchment paper not only makes it easy to use, but makes clean-up a breeze - another time saver on a busy night. The puff pastry feels like a very versatile product to me, one that can be used for both sweet and savory dishes and the fact that it is fresh and not frozen makes it an easy go to for dinners or dessert. I look forward to trying more of the puff pastry recipes, since we wound up only trying the jalepeno poppers at the party. There are so many more recipes that I look forward to trying, you can peruse them yourself here. You can find a local store that carries the Wewalka line, using their store locator here. The guests and my family all enjoyed the opportunity to participate in the Wewalka Baking Party through Tryazon.